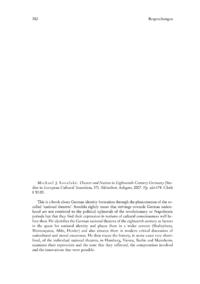 Michael J. Sosulski: Theater and Nation in Eighteenth Century Germany (Studies in European Cultural Transition, 37). Aldershot: Ashgate, 2007. Pp. xii+178. Cloth £ 50.00. This is a book about German identity formation through the phenomenon of the socalled national theatres. Sosulski rightly states that strivings towards German nationhood are not restricted to the political upheavals of the revolutionary or Napoleonic periods but that they find their expression in notions of cultural consciousness well before then. He identifies the German national theatres of the eighteenth century as factors in the quest for national identity and places them in a wider context (Shaftesbury, Montesquieu, Abbt, Herder) and also situates them in modern critical discussion of nationhood and moral awareness. He then traces the history, in some cases very shortlived, of the individual national theatres, in Hamburg, Vienna, Berlin and Mannheim, examines their repertoires and the taste that they reflected, the compromises involved and the innovations that were possible.